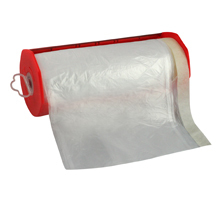 Convenient all-in-one professional pull down drop sheet with masking tape. Repels the messiest paint spills! Ideal for furniture, equipment and floor protection during painting. Designed to handle any paint or home improvement project. These plastic pre-taped drop sheets protect floors, counters, furniture, equipment and much more. Also protects against dust and debris for faster clean-ups. Available in two sizes with or without dispensers. Simply roll out drop sheet, tape, cut and unfold!